I’m having a break from the norm in this post and writing about football. I apologise now if reading that word has made you want to stop reading already, but hang on. The domestic season is now over and so to mark this momentus occasion, I thought I’d look back on some of my favourite moments from the last year before the new season next week. Often watching Sky Sports’ Soccer Saturday is far more entertaining than watching the football itself, especially if it’s Bolton Wanderers. This is Kamra’s finest moment, probably of his entire career. I think you’ve all seen this by now but regardless of whether you have or not it is always worth another viewing. We often see Kamara make mistakes and get way too excited about the games he’s at (unbelievable, isn’t it) but I don’t think anyone for a single second would expect him to miss a red card. But he did. Although there have been some cracking strikes from players you expect to start great goals this season, my choice for the best goal this season goes to Wigan’s Maynor Figueroa. There are several reasons for this. One, it’s from his own half! Although other players have done that over the last few seasons, this one didn’t rely on a slip by the keeper, be towards an open goal or just trickle over the line. No, this flew into the top corner after a great piece of opportunitism. Second he’s a defender. How many left backs do you see failing dismally with shots from 20 yards let alone 50?! And third and he plays for Wigan. Most Wigan player’s can’t score when they’re in the opponent’s penalty area. No look back on a Premier League season would be complete without Jimmy Bullard somewhere. One of the most likeable men in football, the midfielder has overcome some serious knee injuries over the past two years and is playing regular football again. This celebration after his late equaliser was one of the most ingenious ways of commemorating a goal I’ve ever seen. This was as about as good as it got for Hull this season though. If anyone has any an answer asto what the hell is going on (apart from the obvious!) and why, then please do get in touch. This isn’t the photo of when the gaffe took place but it does show the guilty party, Rafael Benitez. The actual gaffe os available here. When Rafa made the ‘guarantee’ that Liverpool would finish fourth in the Premier League they were seventh in the league and 13 points off the top of the table. Seventh is where they stayed, just scraping into the Europa League and finishing 23 points behind Chelsea, a long way off the Champions League guarantee by Benitez in December. After coming second the year before it was a pretty big fall. Well done Rafa. I’ve dropped down the divisions for this one. 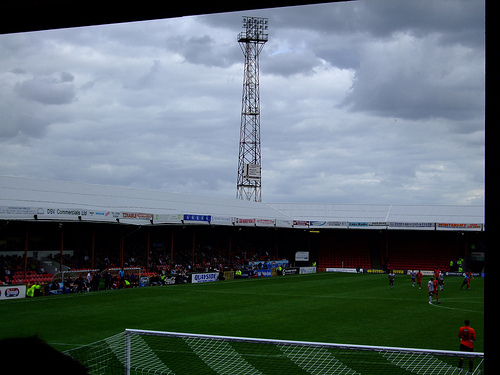 The photo above is of Blundell Park, the home of Grimsby Town who have been in the Football League for 99 years. Sorry, that should say had. Because at the end of the 2009/10 season they dropped down to the Blue Square Premier. Now there is a theory that the lower a team is in the league then the happier the fans. Not this fan though, evidence of which can be found here and here. I have to warn you there is a fair bit of swearing on those links. Still funny though. 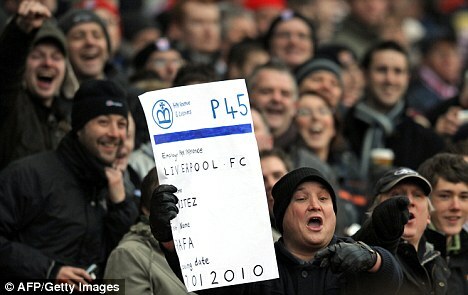 Every football ground has fans who bring banners and placards. This one was made by a Stoke fan when Liverpool visited the Britannia Stadium in January. With pressure on Rafael Benitez mounting as the season went on, this P45 was made for the Liverpool manager who days before had seen his team beaten in an FA Cup 3rd round replay by Reading. This is far more original than any ‘Rafa out’ or ‘you’re getting sacked in the morning’ banners or chants, not that you’d ever see anything like that around Anfield anyway. 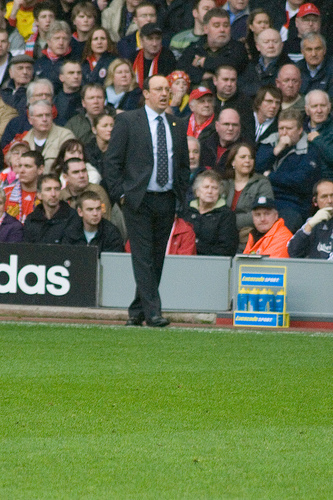 Photo of Rafael Benitez courtesy of Nigel Wilson.